Known as both Crepaco / WCB and APV ice cream freezer knives, California Knife and Blade, Inc. manufactures and supplies thousands of in-stock APV Crepaco Ice Cream Scraper Blades readily available to ship directly from stock the same day. Our Scraper Blades for APV/Crepaco are manufactured using a special process of high polishing and lapping to produce a completely smooth mirror finish. 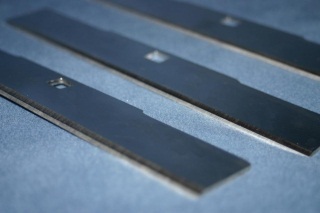 With our well-trained and highly experienced team combined with our in-house high-tech CNC, Wire EDM and laser cutting machines, we provide quality APV Crepaco scraper blades at a very competitive price shipped immediately from stock. California Knife & Blade manufactures any ice cream scraper blades based on blueprint, sketch, technical drawing, or even specifications provided by customer. If you are looking for a company to get your next APV Crepaco scraper blades supplied by to you, you can count on us for our exceptional quality, on-time delivery performance and competitive prices. Let California Knife & Blade help you get the best quality blade at a competitive price within a very short lead time. Our expertise is our capability to manufacture any ice cream scraper blades with the quality exceeding customer's expactation at a competitive price within a short delivery time. Please contact us now to get a quote. To see full list of our ice cream scraper blades and catalog pictures, please visit Ice Cream Scraper Blades webpage on our website.